It's nearly Christmas - yay! And Christmas means indulgence in sugar and spice and all things nice - read, too many Celebrations and copious amounts of alcohol. But it's also that time of year we buy things 'because it's Christmas' and don't give a second thought to for the rest of the year...much like Port. There are few of us wandering the supermarket alcohol aisles on a Friday night (just me?) who'll settle on a bottle of Taylor's 10 Year Old Tawny, but come Christmas it's all 'ooh I need a Port for my cheeseboard!' to impress Mums and Dads, Aunties and Uncles. Port, my friends, is how we know we've matured from Lambrini teen to sophisticated 'it's-not-just-about-getting-drunk' twenty-something. 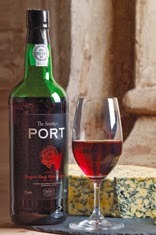 Port is a fortified wine produced exclusively in the Douro Valley in the North of Portugal. Essentially a fortifed wine is wine which has the addition of a distilled beverage (usually Brandy or a neutral spirit) to make the wine stronger in flavour, concentration or alcohol, depending at which point it is added. The base wine of Port can be made up of as many as eighty different grape varieties - anyone brave enough to name them?! - but there are five varieties which most commonly used for Port production; Tinta Barroca, Tinta Cão, Tinta Roriz (aka Tempranillo), Touriga Francesa, and Touriga Nacional. In Port production, the fermentation process is interrupted by the addition of the grape spirit and results in higher residual sugar and a pimped up alcohol volume, resulting in a typically sweeter style. Other fortifieds, such as Sherry, are allowed to complete the fermentation process and the spirit is added after the sugar/alcohol conversion. The result? A drier style, and very different style wine. Those matured in sealed glass bottles, with no exposure to air, giving a smoother, less tannic wine, for example Ruby Port. Those matured in wooden barrels, with some exposure to oxygen. This means they lose colour quite quickly as well as volume, giving a more viscous wine with a nuttier flavour, for example Tawny Port. Technical details aside, Port, in it's varying forms, is incredibly versatile, and with different price points and styles, I'm almost certain you'll find one you love. So why now? Ports make excellent additions to the festive season, and can be served with anything from nibbles and cured meats, to cheeses, desserts and sweet delicacies. A long time Port lover, these are my top picks for Christmas...within budget! in the glass, full-bodied, with lashings of ripe red-fruit flavours and minimal tannin. Sublime drizzled over poached pears and spiced with a little cinnamon, and ravishing with a chocolate pot and fresh raspberries....mmmmm! Crusted Port is a blend of a few harvests and aged in oak casks for two years before bottling without fining or filtration, leaving a 'crust' or sediment in the bottle. This one was bottled in 2006 and is vibrant, youthful and juicy though it's essential you decant a few hours before serving to get the best from this beaut. Smooth and fruity, it pairs well with the creamiest and smelliest of Stiltons or Roquefort. With years of oak cask ageing, this tawny is rich and mellow with complex nutty flavours. This is my favourite style as it's so versatile. For me, it's best served slightly chilled and makes for a refreshing aperitif with nuts or cheesy shortcrust nibbles. It's also a perfect cheeseboard wine, and pairs as well with creamy blue cheeses as it does with vintage Cheddar - and all the dried fruit trimmings! Want to really impress? Serve with sweet roast lobster or foie gras - oooh decadent! This single-quinta (meaning, from one Port house) is just devine. Fuller bodied than the previous styles, this is jam packed with winter blackberries, dark spices and juicy plums. I'd recommend decanting a couple of hours before serving to open it right up. Yes, again, this could be served with a traditional cheeseboard (think ripe, creamy Brie for this one), but shines best with a dark chocolate tart or dense chocolate cake with raspberry sauce....take me to Christmas now please! *Note: You do need to be a member to purchase from The Wine Society, but it's just £40 for a lifetime membership (with no annual fee of obligation) and if you join now you get £20 credit. so it's more than worth it. Cool. I usually benefit from the selection interviews. Many thanks with regard to getting this web site.